Linda Compton was the beloved wife of one of We Hold These Truths founding directors, Tom Compton. She went home to be with her Lord and Savior, Jesus Christ on November 1, 2016. Linda was loved by all who knew her. She was a diligent student of the Bible and taught women's Bible studies for over 20 years. Linda was a perfect example of a compassionate, Christian peacemaker, in thought and deed. This 28 minute podcast is a tribute to Linda, focusing on her courage to change her course, as related to the Bible studies she had been teaching for years. Only when you listen to the whole podcast will you understand the importance of what Linda did. Jesus taught: "Blessed are the peacemakers, for they shall be called sons of God." [Matthew 5:9]. Oh, that more Christians would take that command to heart! Jesus remarked, while teaching at the synagogue in his hometown, Nazareth: “Truly I say to you, no prophet is welcome in his hometown." Pastor Joseph Beach from Amazing Grace Church in Denver, CO, explains how and why the hometown crowd quickly turned from admiring Him as the Messiah, to wanting to kill Him. This was because of what Jesus taught, as reported in the fourth chapter of the gospel of Luke. This is a fascinating study of 34 minutes on a subject that is all but ignored in pulpits across the US. Questions for Pastor Joe follow by Chuck Carlson and members of We Hold These Truths that add some very interesting insights for today's Christians. Are Christians to be Fans or Followers of Jesus? 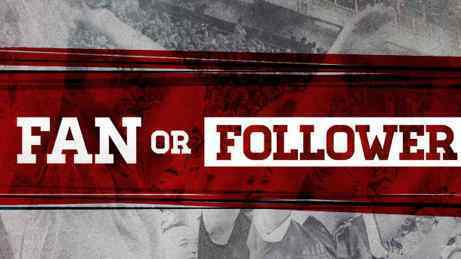 What does it mean to be a fan vs. a follower of Jesus? Chuck Carlson and members of We Hold These Truths discuss this subject in a short introduction to a sermon by Pastor Scott Rice in Colorado. This thought provoking, 38 minute podcast will give Christians pause to think about where they are in the spectrum of fans and followers of Jesus. Pastor Rice recommends the book, "Not a Fan" by Kyle Idelman in his message. In this fascinating lesson, you'll learn from Mark Horton why verse 14 of Hebrews 13 can be an anathema to dispensational Christian believers. [14 For here have we no continuing city, but we seek one to come. KJV] 28 minutes. The purpose of the book of Hebrews was, in part, to prepare God's people to endure what trials may come their way. Mark Horton discusses the examples of Christ's endurance in this lesson of 30 minutes. Mark Horton continues our study of Hebrews with a fascinating look at more heroes of the faith, found in the Old Testament, who pointed the way to the coming of Jesus: Gideon, Barak, Samson, Jephthah, also David and Samuel, the prophets. 26 minutes. In this lesson we learn that Abraham and the patriarchs of the Old Testament long for a heavenly or spiritual realm. Jesus bridges the gap between the physical and spiritual realms. Don't miss the lively questions. Once you listen to this episode, you'll want to listen to all the rest of Mark Horton's lessons on Hebrews. 39 min. Faith is the confidence in unseen things and is associated with righteousness. In this very interesting lesson by Mark Horton, the faith of Able, Enoch, Noah and Abraham are delved into in depth. 34 min. Mark Horton looks into the definition of the word "faith" that is introduced in this section of Hebrews. What are the nuances of the statement: "Now faith is the sustance of things hoped for, evidence of things not seen." 29 mins. In this lesson, Mark Horton discusses the warning given by the writer of Hebrews to the Judean followers of Christ who are contemplating returning to their synagogues to avoid future persecution. 32 mins. In this 32 minute Bible examination, Mark Horton looks at the significance and meaning of the phrase "the blood of Christ" and the "house of God." In the book of Hebrews and throughout the New Testament, physical things are used to demonstrate spiritual truths. In this 28 minute Bible examination by Mark Horton and members of We Hold These Truths we learn that once the Israelite's' temple in Jerusalem was destroyed in 70 AD, no mechanism remained for sins to be covered until the blood of Jesus could do away with them for once and all. God's plan was to cleanse all who would believe, by faith, in Jesus, so that they could go directly to Him, not through the intercessory priesthood of the Old Testament, for forgiveness of sins. In this 28 minute Bible examination, we offer this warning to any dispensational, Christian Zionists who happen to listen: "Warning! This program contains thought provoking ideas that may require a paradign shift for the thinking listener." Mark Horton looks at the concept that it was impossible for the blood of bulls and goats to take away sins. Nothing in the Law of Moses could cleanse the conscience of a guilty sinner. Hebrews stresses the supremacy of unseen spiritual things over physical things. The children of Abraham are children by faith, not by blood lineage. The questions and comments by Chuck Carlson, Richard Edmondson, Craig Hanson and Glen Lesnick make this a great lesson worth a listen or two. In this 34 minute lesson by Mark Horton we learn that the entire gospel is presented in chapter 9 of Hebrews. Also, we learn that the eternal purpose of God was was to create the universe so that man could dwell there and that God could dwell in men's hearts as taught by Jesus. In this 28 minute study, Mark Horton discusses the eternal nature of the New Covenant in Jesus. 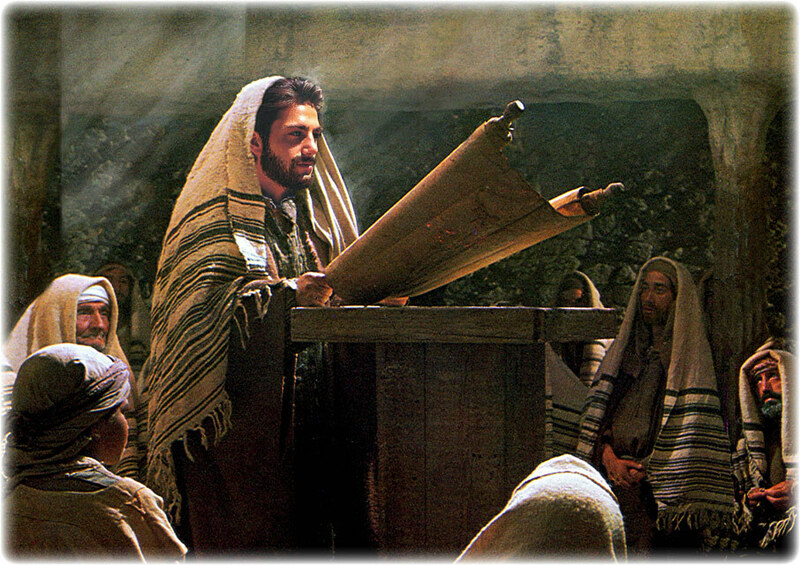 In the Old Covenant, the age of Moses had a beginning and an end. Christ is the only eternal, perfect sacrifice. In Mark Horton's 35 minute lesson, he compares the sacrifices of the Old Covenant to the New Covenant. The blood sacrifices of the old are replaced by the blood of Christ in the new. And, the New Jerusalem, not made with human hands, comes down out of heaven and descends to earth. In this 34 minute study of Hebrews, Mark Horton discusses the "bombshell" the writer of Hebrews reveals about the old covenant, that is referred to as the Law of Moses and was associated with the tabernacle, will soon disappear. When did it end? Was it at the cross with the death of Jesus? In this 32 minute study, we find the use of the term "covenant" is used in Hebrews for the first time. A new and better covenant with the house of Israel and Judah is imminently ready to make the old one obsolete and ultimately vanish. In this 31 minute study, Mark Horton gives some historical background for Hebrews chapters 8, 9 and 10. God inparted his infinite attributes to finite man through Jesus. What could be easier than that to understand? This powerful and inspiring 25 minute message, "Love in the Midst of Animosity" delivered by Sami Awad, a Palestinian Christian from Bethlehem, needs to be heard by all American Christians who claim to be followers of Christ. Sami speaks about the command of Christ to even love your enemies. Sami is well qualified to talk about this command since his family lost their home in 1948 when Israel was founded, and his grandfather, a noncombatant, was killed by Jewish forces. Palestinians, whether Christians or Muslims, continue to suffer under a brutal Israeli military occupation today. Sadly, most American Christians only know and believe the Israeli side of the story. Wouldn't it be a miracle if Christian Zionists would open their eyes to the suffering and hardship endured by their Palestinian brothers and sisters in Christ and show compassion for both sides equally? 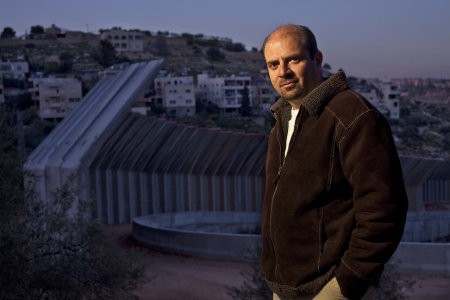 Sami Awad is the founder of the Holy Land Trust, a peacemaking organization based in Bethlehem. 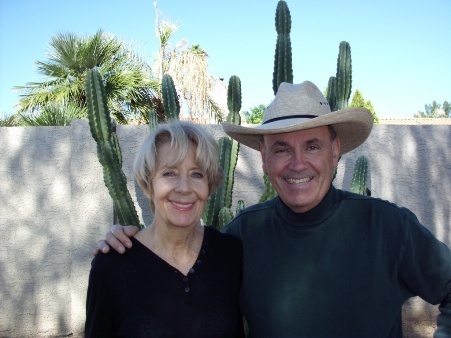 This message was delivered at the Mountain View Presbyterian Church in Scottsdale, AZ on Sept. 21, 2014. In this 26 minute study, Mark Horton compares Jesus as a high priest forever to Melchizedek, who served as a type of Christ as his predecessors or successors were not recorded in the Bible. The Aaronic priesthood is revealed as imperfect and temporal while Melchizedek's priesthood is superior. Melchizedek, king of Salem, and his relation to Abraham is discussed in this lesson by Mark Horton. We learn why Melchizedek received a tithe from Abraham even though his genealogy was not derived from the line of priests, the sons of Levi. And, we learn the significance of it. The writer of Hebrews compares the old age to the new age that is coming with the destruction of Jerusalem resulting in a transfer from a physical Israel to a spiritual Israel. Abraham is the patriarch and Jesus is the physical and spiritual offspring. In this lesson, Mark Horton compares the qualifications of Christ for being the high priest to those of the high priests of the Old Testament. Mark Horton delves into what the writer of Hebrews means by "a promise remains of entering His rest..." in chapter four. Click here to see the time line Mark refers to in this lesson. The old family of God was represented by Israel while the new family of God consists of all the followers of Jesus Christ whose kingdom is a spiritual one. Mark Horton's lesson helps unravel this mystery that causes divisions among Christians. Mark Horton continues with our study of the book of Hebrews. We learn that Christ is superior because of His humanity. Also, Mark includes an interesting discussion on the concept of audience relevance. Was the book of Hebrews written for application by the audience reading it shortly after it was written or was it intended for application today, or both? 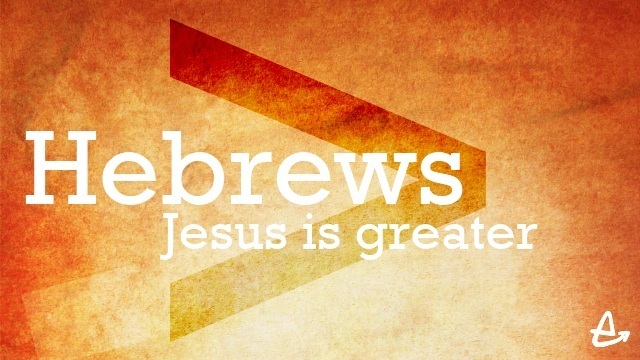 The basic theme of Hebrews is found in the word "better" (used 13 times) describing the superiority of Christ in His person and work. Hebrews starts out with the phrase "...in these last days spoken to us by His Son." Find out why this is troublesome to some Christians. Why not check out Mark Horton's dynamic commentary of the book of Hebrews. 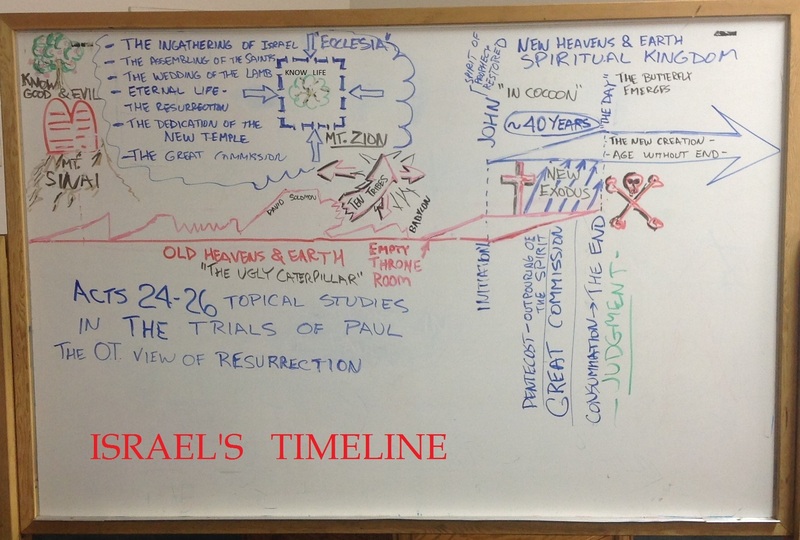 The chart "Israel's Timeline" referenced by Mark in the study, can be seen here. Mark Horton starts our study of the book of Hebrews with detailed background information on the book. It appears that the book was not written by the Apostle Paul buy the author was influenced by him. Mark contends that the author of Hebrews would find that modern day dispensationalists' beliefs that the end times would require a return to the physical forms and rituals of the ancient Israelites, to be an abomination. The book of Hebrews demonstrates that the old covenant was inferior to the superior spiritual reality that appeared in Jesus Christ. Jesus is greater! Before you dive into the complete and fascinating study of the book of Acts by Mark Horton, listen to the two reviews of the book: Acts - Review 1 (Part 59) and this one to get a flavor of the insight you will gain from an in depth study. the high points of our study of the book of Acts that are often missed, ignored, or buried by most biblical commentators, clergy and religious potentates. In this first review Mark reviews inportant background material from Luke and chapters 1 thru 8 in Acts. Also, check out Acts - Review 2 (Part 60) for Mark Horton's final review of Acts. In the last chapter of Acts, Mark Horton discusses the idea that the Kindgom of God, the Hope of Israel and the Gospel of Christ are synonymous ideas. Click Here to see the timeline mentioned in the lesson. Another fascinating study by Mark Horton as we near the end of our study in Acts. We learn that Paul's appearance in Rome before the Judean leaders there, to preach the gospel of the kingdom, was far more important than his trial before Nero's court. Mark Horton discusses in depth, Paul's views of the resurrection during his trials. Mark Horton continues our study of Paul's trial and the nature of the resurrection and an explanation of the Heresy of Hymenaeus. Pastor John Hagee of Christians United For Israel recently wrote a book, Four Blood Moons: Something Is About To Change, that is a New York Times bestseller. 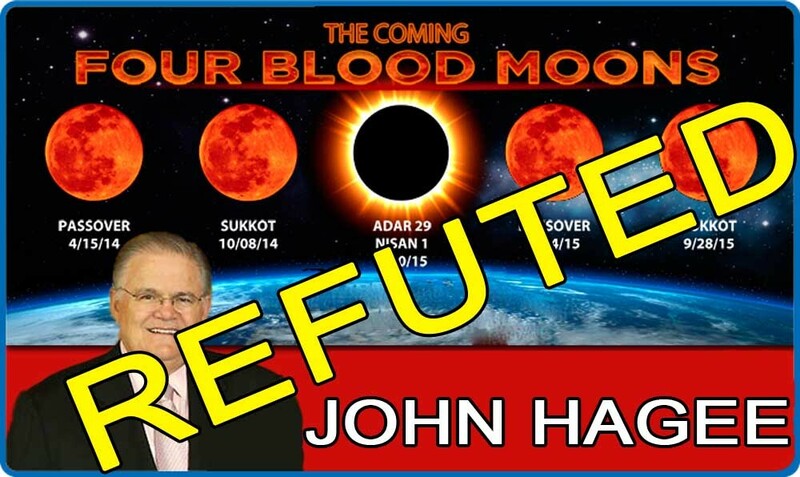 It seems Hagee is trying to speed up the return of Jesus using a predictable astronomical event as a sign o f the end times. 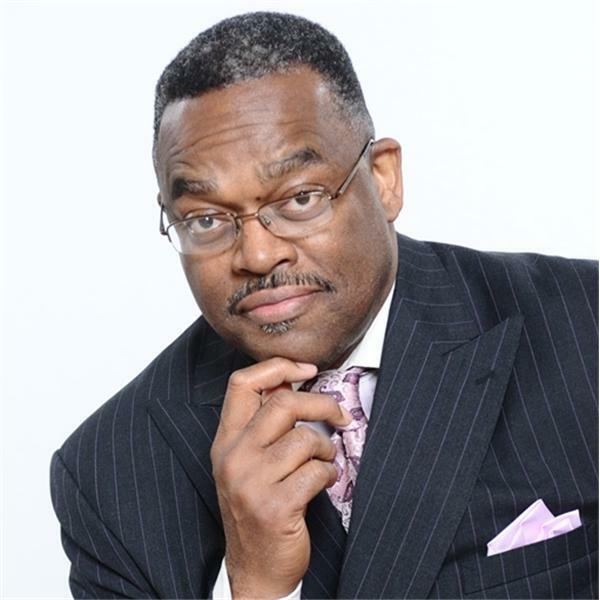 Our friend Pastor William Bell (Eschatology: All Things Fulfilled) has studied Hagee's scriptural claims in his book and replies in this podcast with logical and well reasoned, scriptural challenges. Mark Horton continues a look at Paul's view of the resurrection and the hope of Israel by looking into Eziekel 37. Mark Horton responds to some lively questions about the dispensational and non-dispensational interpretations of Paul's views the nature of the resurrection of Israel. The trial of Paul continues in Caesarea with King Agrippa examining him for Roman governor, Festus. The physical state of Israel was spiritually dead during Paul's ministry. Paul appealed his case to Caesar Augustus. The Roman governor, Festus determined that Paul had committed nothing worthy of death. King Agrippa tries Paul in order to come up with a charge that Paul can be used against him in Rome. Mark Horton has some interesting insights into one of the charges made concerning the resurrection. Paul asks King Agrippa, "Why should it be thought by you that God raises the dead?" Paul appeals his case to Caesar rather than go to Jerusalem where the Judean leaders want to kill him. In his trial before Felix, the Roman governor in Caesaria, Paul is accused of attempting to defame the temple in Jerusalem. Paul's fellow Judeans plan to kill him in Jerusalem but are thwarted by a God ordained informant. After Paul's arrest, the Roman commander allows him to speak to the mob in Jerusalem that wants to kill him.